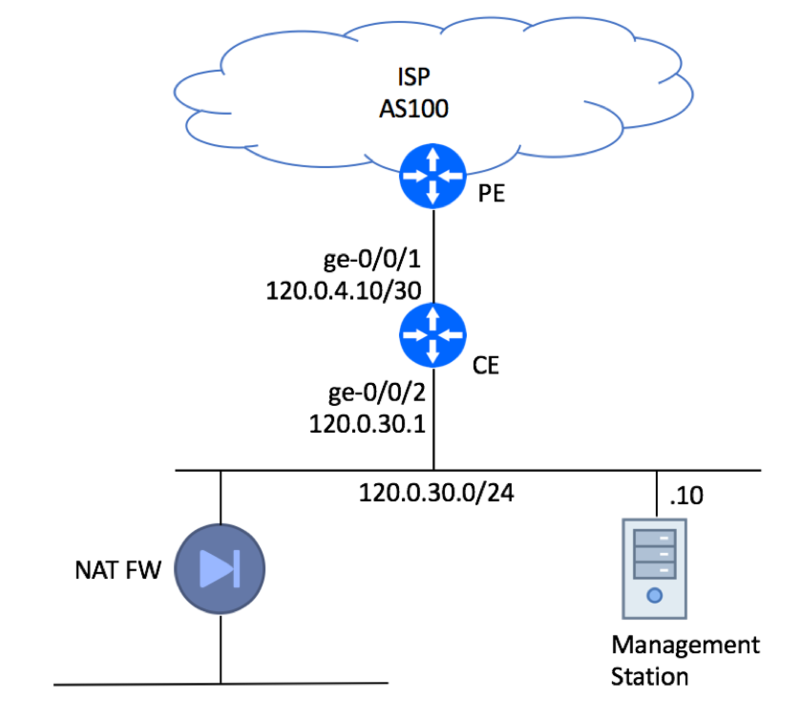 In this example, we will show recommended configuration for a Single-homed Single CE device using private AS with an upstream ISP. It is assumed that management of this device will be performed from a dedicated server residing within Customer’s Network. This type of setup is quite common in an environment where a dedicated firewall performing source NAT function is setup to protect customer infrastructure. Please note, that the Management Station is connected directly to the LAN interface for illustration purpose only. In real production deployments, Management Station must be protected by a firewall. Next step is to secure the router itself. But default, it will pass any traffic (with some exceptions, not covered in this article) and accept connections from anywhere on the Internet. Your job is to make sure that only trusted sources can communicate with your device (control plane protection) and spoofed traffic is not allowed in and out of your network (data plane protection). 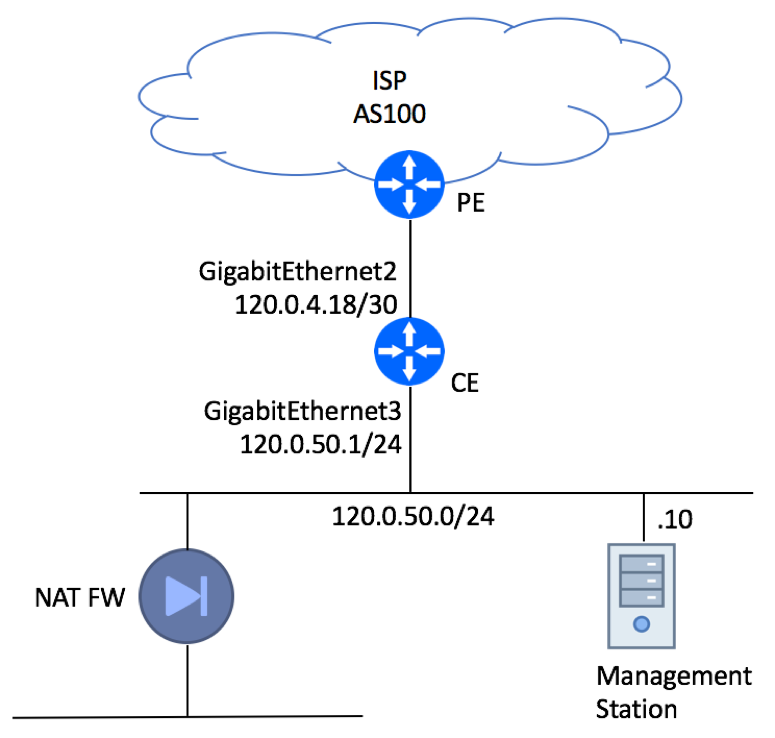 Configure interface with security commands and uRPF on the LAN interface. Note that ‘no ip unreachables’ will block traceroute. Disconnect IMMEDIATELY if you are not an authorized user! Single-homed CE Device with EBGP. Please note, that the Management Station is connected directly to the LAN interface for illustration purpose only. In real production deployments it must be protected by a firewall. Configure BGP Group for your Upstream ISP. Configure the “export” statement to advertise your 120.0.30.0/24 subnet to the Internet and “import” statement to receive the default route. Configure MD5 Authentication Key. Make sure the description field includes the Circuit ID assigned to your link and ISP’s contact phone so you would not need to search for this information in an event of an outage. set protocols bgp group ISP-AS100 authentication-key "$9$9UPDt0IylMNdsEcds24DjCtu"
set protocols bgp group ISP-AS100 neighbor 120.0.4.9 description "ISP FastAccess: Circuit GD8AJ12B: ISP NOC 800-111-2222"
We’ll start with the data plane, where we need to take care of packets leaving your network and packets coming in. While it is important to discard malicious traffic that tries to pass through your router, it is even more important to drop bad packets destined to your infrastructure device. All router-bound traffic must be dropped unless it comes from a known and trusted source. In our example, we can trust ISP’s PE router as we’ll be establishing EBGP session with that device and dedicated server (120.0.30.10) used for device management. We will also allow Ping and Traceroute packets. Everything else will be dropped. These filters will be applied to Lo0 interface (Juniper’s Control plane interface). set system root-authentication encrypted-password "abc"
set system login user bgphelp authentication encrypted-password "abc"
set interfaces ge-0/0/1 description "'CE3->PE2'"
set interfaces ge-0/0/2 description "LAN Segment"
set snmp contact "IP NOC 1-345-12-1234"